Ah ma! Ah ma! I want another slice of that. The brownish-orange cake with the smooth cream frosting on top. What is that name again? Yes, carrot cake. Another slice please, before kor-kor comes back from school. Time passed, and ages caught up with us eventually. Ah ma is no longer as young as she was before. And the energy, effort put into making the kuehs, also diminished with every passing day. Coffee Bean’s carrot cake isn’t the best carrot cake that I’ve. But then again, I didn’t have that many before to compare it with. And yes, I know I haven’t try the legendary one from Cedele yet. Anyway, even though the cream frosting was generous, but the raisins were too much for my personal liking. And the No-study sign is a joke. haha, grandma = angmoh grandma, not chinese one la. which chinese grandma noe how to make this type except the chai tow kway maybe! i used to like cedele until i tried the one from prive. its really nice la (at least i find it so). when u go prive again u must try the carrot cake k! I’ve never had a good carrot cake. Perhaps because I had bad carrot cakes early on and subsequently pass on all others that I come across. evan: hahaha there might have some very hip grandmas who know how to make this type ma! aiyoh. lol! yeah gonna try the prive carrot cake that u have been raving about. heeh. and i’ll be one of those hip grandmas who makes the all american carrot cake next time. *sheesh*.. i don’t think tattoos age well though. haha. I wanna try the prive carrot cake too! i honestly haven’t tried ANY carrot cake before.. the name just kind of make me not want to eat it =x haha! haha! 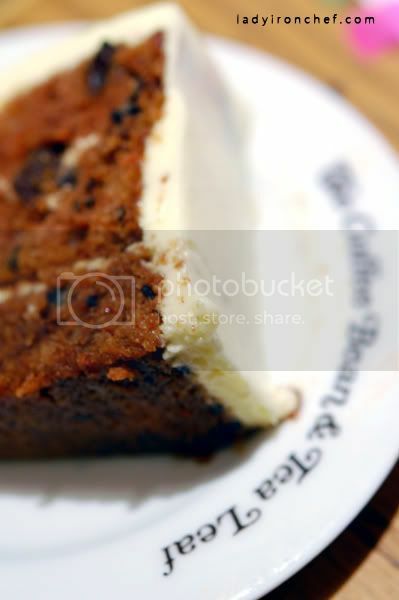 I lovee carrot cake (: however I think that the one at coffee bean is totally not worth the money. it’s too sweet and I got quite sick of it halfway through. the cedele one is much better. layla: oh mine. you should try it, at least once. haha! it’s not as bad as you thought, maybe just go and have cedele’s one. oh u don’t like raisins? prive one has lots in there haha, particularly why i like it i guess. but all carrot cake got raisins what! evan: hmm, no leh, not all carrot cakes got raisins one what! It’s satisfying and best of all, cheap so to sum it up, value-for-money – The Soup Spoon. laura: yeah it’s cheap for that big slice of cake. foodaholics: hahaha its recession now. lol! So sad to see bad reviews of CB’s carrot cake. I <3 it a lot! I actually tried Cedele’s before but did not like it as much. I think it has spices?? Can’t remember exactly but I agree, the cream layer is delish! My favourite is the one at Cedele. Coffee Bean is only good for their breakfast sets. loop: yeah i haven try the cedele one yet. omg! For those of you who love carrot cake then why don’t you give Calendar’s carrot cake a try? It is the best!